Have you ever had Texas Sheet Cake? It’s made up of a thin layer of moist chocolate cake topped with a layer of warm, poured chocolate icing and sprinkled with pecans — an easy, unfussy cake to make for a crowd! The origins of this cake are murky. Some sources say it may have first shown up in a Texas newspaper, which is why it’s called “Texas” sheet cake, while others claim the name comes from the fact that it’s the size of Texas. Regardless of its origins, this cake is truly a crowd-pleaser—I sent one version to my husband’s office and there was a legit line of people waiting to snag a slice. WHAT MAKES AN AUTHENTIC TEXAS SHEET CAKE? There are some versions that swap out the buttermilk for sour cream (I tried it and didn’t think it changed the final result). Instead of water, some recipes use coffee, which enhances the cocoa flavor and makes for a richer tasting cake. Feel free to use it if you have some on hand. Some versions also left the nuts out altogether, though I think they add a much appreciated crunch so I kept them in my version. I also tried a version topped with half toasted coconut and half mini chocolate chips; both were delicious so give them a try if you like! BAKE IN A SHEET PAN—OR CHANGE IT UP! The classic recipe is meant to be very thin and is baked in a 13×18-inch sheet pan (technically a “half-sheet” pan). This will make about 36 slices. This said, you can also make this cake in a 9×13-inch pan to make a thicker cake, or you can make it into 24 cupcakes. The baking time will be about 10 minutes longer for the 9×13-inch cake and slightly shorter for cupcakes; bake until a toothpick inserted in the middle comes out clean. While the frosting helps keep this cake ultra-moist, make sure not to over-bake the cake. It is so thin that it can quickly dry out if left too long in the oven. Bake just until a toothpick inserted in the center comes out clean and the top springs back to the touch. The frosting should be poured onto the cake while both are warm; this way, some of it soaks into the top layer of the cake and creates a glazed top. However, it’s crucial that the cake not be too hot. I tried pouring the frosting right when the cake came out of the oven, and that was a mistake—the cake ended up mostly absorbing it. On my next attempt, I let the cake rest a few minutes while I prepared the icing and then poured it on. A couple of minutes made all the difference between the cake top looking like the cratered surface of the moon versus a nice shiny glaze. Also, be sure to sprinkle any toppings you want as soon as the icing is poured, as it starts to set almost immediately into a thick glaze—similar to that on a donut, with a matte finish. After frosting, you can serve this cake immediately, or a day or two later. To slice, serve the cake straight from the pan. Slice it with a thin, sharp knife and use a thin, flexible spatula to transfer each slice to a plate. Store slices of leftover cake on the counter in an airtight container with a lid or covered in plastic wrap. This cake also freezes well, too. Just be sure to wrap it well in plastic once the icing is completely set and dry to the touch (otherwise the plastic will stick to it). Loosen the plastic wrap and bring it to room temperature on the counter for a few hours before serving. 1 Preheat the oven and prep the pan: Preheat the oven to 350°F. 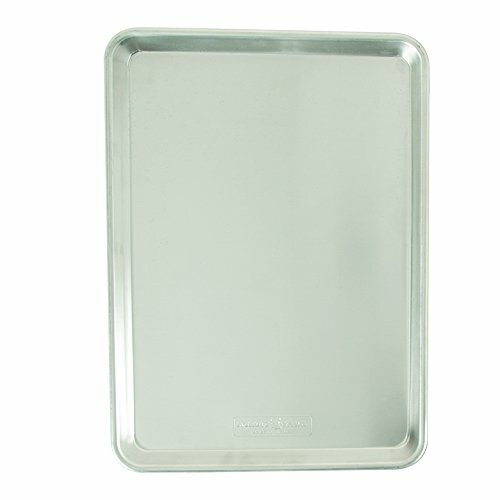 Spray or butter a half-sheet pan (13x18 inches) and line the bottom with parchment. 2 Combine the dry ingredients: Whisk the flour, sugar, and salt together in a large mixing bowl. 3 Make the batter: In a saucepan over medium-low heat, combine the butter, water, and cocoa powder. Whisk until melted and smooth, and then bring to a simmer. Once simmering, remove from the heat. Using a whisk or electric mixer, beat the hot cocoa mixture into the dry ingredients until combined. Beat in the buttermilk, eggs, and vanilla, followed by the baking soda, until combined. 4 Bake the cake: Spread the batter into the prepared pan and bake for 25 to 28 minutes, or until a toothpick inserted in the center comes out clean. 5 Frost the cake: As soon as the cake is done baking and on the cooling rack, combine the butter, cocoa, and milk for the frosting together in a saucepan and bring to a boil. Remove from the heat and stir in the salt and vanilla. Beat in the powdered sugar with an electric mixer or by hand. Pour the hot frosting over the still-warm cake and spread evenly. Sprinkle the top with chopped pecans or other topping. Allow to set, then serve immediately or cool completely and cover to serve later. You can also wrap the cake well in foil or plastic wrap and freeze. Hello! All photos and content are copyright protected. Please do not use our photos without prior written permission. If you wish to republish this recipe, please rewrite the recipe in your own unique words and link back to Texas Sheet Cake on Simply Recipes. Thank you! Cake was not deep chocolate and the frosting was too fudgy and grainy although I beat it thoroughly with an electric mixer. I was really disappointed. I have been making this cake for over 50 years. This is a family favorite and frequently requested by friends. Your recipe is exactly how I make mine. I made it for a community event, it’s all gone! I’ve been making this for years as well…Like one of the previous posters, I also add some cinnamon to the batter, and, often, a little bit of cayenne pepper as well (maybe 1/4-1/2 tsp, just enough to leave a tingle on my tongue if I taste the dry ingredients). I’ve made a recipe similar to this and it was fantastic. Mine used 3/4 cup oil and 1/4 cup butter. It used sour cream rather than buttermilk and extra egg yolks. But pretty much the same recipe. I fixed it for a wake I catered and it was really a hit. I also took it to a pot luck reunion and again it was a hit. You won’t regret making this. Just know that you may have to share it with neighbors, friends and relatives as it makes a large cake and it is rich but oh so yummy. and sprinkle with the pecans. Always a hit with the family and potlucks. Yum yum yum!!! Of course I had to make it! I’m deep in the heart of Texas! It was a hit amongst the 20-odd Soldiers we served it to here in Fort Hood. Um, I’ve never made this cake before but it sounds AMAZING! I’m a 5th generation Texan and yes, this is the real deal. It is at every summer family reunion and neighborhood bbq. If you are lucky, another family brings homemade vanilla ice cream. I’ve been making a variation of this for a million years, but the last time I made it, I used half milk and half bourbon in the frosting. It was an excellent life decision. Try adding a heaping tsp of cinnamon to the cake and the icing. Then it will be a REAL Texas sheet cake!